Hachette Audio, 2018. 9.5 hours on 8 CDs. I listened to this in audio form, then put the print book on hold so I could pull out the main points for this review. I’m finding I want to read it again. I’ve read other books on finding joy, most notably Champagne for the Soul, by Mike Mason. This one is very different, not looking at joy from a spiritual or emotional perspective, but from a design perspective. It turns out that certain objects and certain sights can actually spark joy. In this book the author categorizes the types of things that bring joy and tells about visiting places that embody this. It’s a fascinating book and will give you plenty of ideas to try in order to bring joy into your everyday life. This is a perspective on joy that I never thought of before, and I love it. In the introduction, she talks about finding joy in physical things. I noticed many moments when people seemed to find real joy in the material world. Gazing at a favorite painting in an art museum or making a sandcastle at the beach, people smiled and laughed, lost in the moment. They smiled, too, at the peachy light of the sunset and at the shaggy dog with the yellow galoshes. And not only did people seem to find joy in the world around them, but many also put a lot of effort into making their immediate environment more delightful. They tended rose gardens, put candles on birthday cakes, and hung lights for the holidays. Why would people do these things if they had no real effect on their happiness? A body of research is emerging that demonstrates a clear link between our surroundings and our mental health. For example, studies show that people with sunny workspaces sleep better and laugh more than their peers in dimly lit offices, and that flowers improve not only people’s moods but their memory as well. As I delved deeper into these findings, joy started to become less amorphous and abstract to me and more tangible and real. It no longer seemed difficult to attain, the result of years of introspection or disciplined practice. Instead, I began to see the world as a reservoir of positivity that I could turn to at any time. I found that certain places have a kind of buoyancy – a bright corner café, a local yarn shop, a block of brownstones whose window boxes overflow with blooms – and I started changing my routines to visit them more often. On bad days, rather than feeling overwhelmed and helpless, I discovered small things that could reliably lift my spirits. I started incorporating what I learned into my home and began to feel a sense of excitement as I put my key into the lock each evening. Over time, it became clear to me that the conventional wisdom about joy was wrong. Joy isn’t hard to find at all. In fact, it’s all around us. The liberating awareness of this simple truth changed my life. As I started to share it with others, I found that many people felt the impulse to seek joy in their surroundings but had been made to feel as if their efforts were misguided. One woman told me that buying cut flowers lifted her spirits for days, but she felt like it was a frivolous indulgence, so she only did it on special occasions. It had never occurred to her that for the price of one of her weekly therapy sessions, she could buy a bunch of flowers every other week for a year. Another described how she had walked into her living room after repainting it and felt an “ahhh” feeling – a sense of relief and lightness that made her wonder why she had waited so long to do it. I realized that we all have an inclination to seek joy in our surroundings, yet we have been taught to ignore it. What might happen if we were to reawaken this instinct for finding joy? 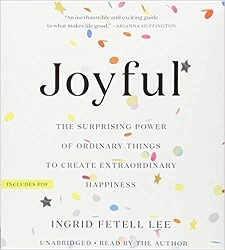 As she studied joy and sought out the aesthetics of joy, she was able to make connections and put them into ten categories. The ten chapters of the book delve into these ten aesthetics in lovely rambling detail. They give ideas for how you can build them into your own life, but in many cases tell about someone who has indulged in this particular aesthetic in a big way – with striking results. The final chapter in the print book wasn’t included in the audiobook (unless there were extra files I didn’t notice) – a Joy Toolkit with worksheets to fill out to help you fill your own life with joy. Random House, 2018. 298 pages. I love Brené Brown’s books, beginning with The Gifts of Imperfection, which is wonderful reading for any recovering perfectionist like me. This current book seemed repetitive, with lots of material from her previous books. 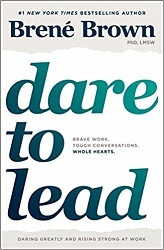 Then I noticed the second subtitle on the cover: Daring Greatly and Rising Strong at Work. This book is all about using the principles from the previous books in a work setting. I’ve always been told, “Write what you need to read.” What I need as a leader, and what every leader I’ve worked with over the past several years has asked for, is a practical playbook for putting the lessons from Daring Greatly and Rising Strong into action. There are even a few learnings from Braving the Wilderness that can help us create a culture of belonging at work. If you’ve read these books, expect some familiar lessons with new context, stories, tools, and examples related to our work lives. If you haven’t read these books – no problem. I’ll cover everything you need to know. There are four Parts to the book: Rumbling with Vulnerability, Living into our Values, Braving Trust, and Learning to Rise. It’s all about living authentically and being willing to be vulnerable with your co-workers and being able to speak truthfully with one another. Even though it was a bit repetitive, and even though some of the acronyms are clunky, and V for Vault in the acronym BRAVING still makes me laugh – many of the ideas here are worth being reminded about – in a nice consolidated format. After all, I do want to live by my values and be whole-hearted with my co-workers. Putting these ideas into practice will make you a stronger and more authentic person. Avery (Penguin Random House), 2016. 354 pages. To celebrate one of our special birthdays, we met for a week in Dharamsala to enjoy our friendship and to create something that we hope will be a birthday gift for others. There is perhaps nothing more joyous than birth, and yet so much of life is spent in sadness, stress, and suffering. We hope this small book will be an invitation to more joy and more happiness…. Our cowriter, Douglas Abrams, has kindly agreed to assist us in this project and interviewed us over the course of a week in Dharamsala. We have asked him to weave our voices together and offer his own as our narrator so that we can share not only our views and our experience but also what scientists and others have found to be the wellsprings of joy. You don’t need to believe us. Indeed, nothing we say should be taken as an article of faith. We are sharing what two friends, from very different worlds, have witnessed and learned in our long lives. We hope you will discover whether what is included here is true by applying it in your own life. 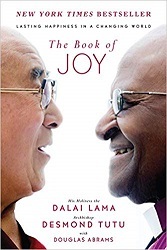 The rest of the book is told from Douglas Abrams’ perspective, telling about the joyful meeting between the Dalai Lama and the Archbishop, and their discussions about Joy. The book is beautiful, reflecting the Joy and Love and Compassion between these two men, but also reflecting thoughts on Joy both the Christian and Buddhist perspectives. It’s lovely how complementary those perspectives are. The two men met over five days, and the book follows their discussions through those five days. They covered “The Nature of True Joy,” “The Obstacles to Joy” (Fear, Stress, and Anxiety; Frustration and Anger; Sadness and Grief; Despair; Loneliness; Envy; Suffering and Adversity; and Illness and Fear of Death), and “The Eight Pillars of Joy” (Perspective, Humility, Humor, Acceptance, Forgiveness, Gratitude, Compassion, and Generosity). There’s much wisdom in these pages, as well as a bit of a story of these two men from very different backgrounds and their friendship. I like the way, by using words from leaders of two religions, it has something for people of many different faiths. Be sure to check some quotations I pulled from this book. Gallery Books (Jeter Publishing), 2017. 292 pages. 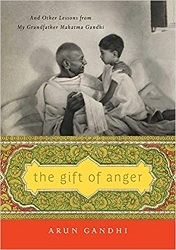 This book is filled with stories of things that Arun Gandhi learned as a child when he lived for two years on the ashram with his grandfather, Mahatma Gandhi. I read a chapter a day, which gave me some nice, inspirational food for thought. I learned much I didn’t know about Mahatma Gandhi, but what I love most about this book is how it radiates peace and nonviolence. Reading this book makes it much easier to see how counterproductive it is to hold onto anger. The chapters themselves are listed as “lessons.” So “Lesson One” is “Use Anger for Good.” Lesson Four is “Know Your Own Worth.” Lesson Five is “Lies Are Clutter.” Lesson Six is “Waste Is Violence.” And Lesson Eight is “Humility Is Strength.” The book includes eleven lessons, all illustrated by stories and insiights. Lesson Nine gives us “The Five Pillars of Nonviolence,” and throughout the book, a picture develops of the power of a nonviolent life. Bapuji looked over at me from behind his spinning wheel. “I am glad to see you can be moved to anger. Anger is good. I get angry all the time,” he confessed as his fingers turned the wheel. I could not believe what I was hearing. “I have never seen you angry,” I replied. Grandfather explained that when he was a boy in South Africa, he too had suffered from violent prejudice, and it made him angry. But eventually he learned that it didn’t help to seek vengeance, and he began to fight against prejudice and discrimination with compassion, responding to anger and hate with goodness. He believed in the power of truth and love. Seeking revenge made no sense to him. An eye for an eye only makes the whole world blind. And that’s only the first lesson! The lessons progress, and are usually accompanied by stories from Arun’s life with his grandfather, though there are usually other illustrations as well. The lessons include Mahatma Gandhi’s time of political activism, using nonviolent protest to free India from British rule, and they continue all the way up to his death, and Arun’s struggles with wanting revenge. Ultimately, honoring his grandfather’s legacy won out. “Forgiveness is more manly than punishment,” Bapuji had said. When we are tested, we don’t prove our strength with violence or anger but by directing our actions for good. India had given Bapuji the great gift of a brief peace after his death. I had to give him the similar gift of forgiveness in the face of great evil. Bapuji had once explained that it is easy to love those who love you, but the real power of nonviolence comes when you can love those who hate you. There’s lots of wisdom in this little book. Alfred A. Knopf, 2017. 226 pages. 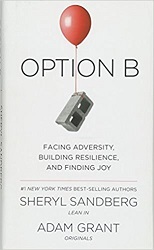 Option B is a book about grief. Sheryl Sandberg’s husband Dave died suddenly after they had been married only eleven years. This book is framed as the story of her loss and the hard road of recovery, but she’s extended the application to a look at how to build resilience in the face of adversity. Yet try as we might to prevent adversity, inequality, and trauma, they still exist and we are still left to cope with them. To fight for change tomorrow we need to build resilience today. Psychologists have studied how to recover and rebound from a wide range of adversity — from loss, rejection, and divorce to injury and illness, from professional failure to personal disappointment. Along with reviewing the research, Adam and I sought out individuals and groups who have overcome ordinary and extraordinary difficulties. Their stories changed the way we think about resilience. This book is about the capacity of the human spirit to persevere. We look at the steps people can take, both to help themselves and to help others. We explore the psychology of recovery and the challenges of regaining confidence and rediscovering joy. We cover ways to speak about tragedy and comfort friends who are suffering. And we discuss what it takes to create resilient communities and companies, raise strong children, and love again. Hundreds of studies have shown that children and adults recover more quickly when they realize that hardships aren’t entirely their fault, don’t affect every aspect of their lives, and won’t follow them everywhere forever. Recognizing that negative events aren’t personal, pervasive, or permanent makes people less likely to get depressed and better able to cope. 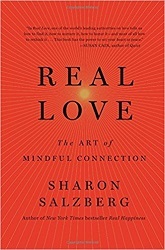 This book is best and most powerful in all the personal moments she shares about her own struggles after her husband’s death. Bringing in psychological research and other stories of loss does reinforce those lessons, but they almost feel canned in comparison. And although the authors work to make the book applicable to building resilience in any adversity, I would most recommend it to people who are also dealing with the death of someone close to them. Don’t shoot me, but I’ve long thought that in many ways divorce is worse than the death of a spouse. 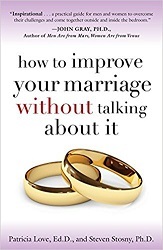 Reading this book reminded me that in many ways the death of a spouse is worse than divorce. Both are terrible, and in dealing with both you need resilience. But I’m not sure I would have liked reading this book when my divorce was fresh. Because she got to keep her good memories of her spouse, and they weren’t tainted by wondering when he stopped loving her. As she grew and healed to where she was ready to try to love again, she didn’t have to figure out how to stop loving her spouse, who was not the loving husband she thought he was. Her world was shaken — but in just similar enough ways, I think I would have envied her if I’d read this ten years ago. And been mad at her for not realizing how lucky she was but also been ashamed of myself for not realizing how horribly unlucky she was — in short, I think it might have added to my mess of emotions for being so close but so far from what I was going through. However, ten years down the road, after reading this book, I’m almost ashamed to even compare my journey with hers. I think perhaps because I did work at falling out of love with my ex-husband and I truly don’t want him back any more, the grief doesn’t last as long. But the lessons of resilience that she points out will help you through whatever Option B you have to settle for. I like the way she winds things up in the final chapter. But just as grief crashes into us like a wave, it also rolls back like the tide. We are left not just standing, but in some ways stronger. Option B still gives us options. We can still love . . . and we can still find joy. Tragedy does not have to be personal, pervasive, or permanent, but resilience can be. We can build it and carry it with us throughout our lives. Avery (Penguin Random House), 2015. 279 pages. 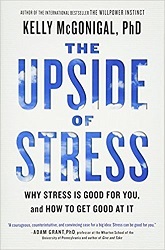 The same friend who recommended Kelly McGonigal’s book The Willpower Instinct to me also recommended The Upside of Stress. Even though I don’t think of myself as having a big problem with stress, I also hadn’t thought of myself as having a big problem with willpower – so this time, I put the book on hold right away, and was not surprised when it turned out to be outstanding. We’ve all heard about the dangers of stress. Too much stress is bad for you, right? Well, this book looks more closely at that question. It turns out that if you think stress is bad for you, then it is. But if you focus on the upsides of stress – and there are many – stress can actually be good for you. So all by itself, reading this book can make you healthier! You will learn about the many positive effects of stress, thus breaking the belief that stress is bad for you, thus ensuring it is not as bad for you. On top of that, of course, you’re going to be much happier, the next time you’re in a stressful situation, when you start remembering the good it can do you. Here’s how the author summarizes her purpose after she saw these new studies about stress. So, my goal as a health psychologist has changed. I no longer want to help you get rid of your stress – I want to make you better at stress. That is the promise of the new science of stress, and the purpose of this book. I like the way, in both her books, she bases everything on scientific studies. It’s helpful to know a little about the science behind embracing stress for two reasons. First, it’s fascinating. When the subject is human nature, every study is an opportunity to better understand yourself and those you care about. Second, the science of stress has some real surprises. Certain ideas about stress – including the central premise of this book: that stress can be good for you – are hard to swallow. Without evidence, it would be easy to dismiss them. Seeing the science behind these ideas can help you consider them and how they might apply to your own experiences. The advice in this book isn’t based on one shocking study – even though that’s what inspired me to rethink stress. The strategies you’ll learn are based on hundreds of studies and the insights of dozens of scientists I’ve spoken with. Skipping the science and getting straight to the advice doesn’t work. Knowing what’s behind every strategy helps them stick. So this book includes a crash course in the new science of stress and what psychologists call mindsets. You’ll be introduced to rising-star researchers and some of their most intriguing studies – all in a way I hope the reader can enjoy. If you have a bigger appetite for scientific details and want even more information, the notes at the end of this book will let you dig deeper. But most important, this is a practical guide to getting better at living with stress. Embracing stress can make you feel more empowered in the face of challenges. It can enable you to better use the energy of stress without burning out. It can help you turn stressful experiences into a source of social connection rather than isolation. And finally, it can lead you to new ways of finding meaning in suffering. Why would seeing the good in stress help in these circumstances? I believe it is because embracing stress changes how you think about yourself and what you can handle. It is not a purely intellectual exercise. Focusing on the upside of stress transforms how you experience it physically and emotionally. It changes how you cope with the challenges in your life. 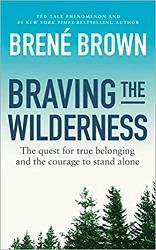 I wrote this book with that specific purpose in mind: to help you discover your own strength, courage, and compassion. Seeing the upside of stress is not about deciding whether stress is either all good or all bad. It’s about how choosing to see the good in stress can help you meet the challenges in your life. Many of the interesting studies of stress looked at people’s biological response to stress. You’ve all heard of fight-or-flight, right? Well, that’s only one possible response to stress. We find different physiological changes in the different responses. There are several prototypical stress responses, each with a different biological profile that motivates various strategies for dealing with stress. For example, a challenge response increases self-confidence, motivates action, and helps you learn from experience; while a tend-and-befriend response increases courage, motivates caregiving, and strengthens your social relationships. Alongside the familiar flight-or-flight response, these make up your stress response repertoire. I think my favorite chapter was titled “A Meaningful Life Is a Stressful Life.” It turns out there’s a strong correlation between high levels of stress and engaging in meaningful activities – which shouldn’t actually be a surprise. But I liked the observation that just thinking about the meaning behind your stress – why you’re doing this – can increase the physical benefits of stress. One of the studies cited just asked students to write about their values – and this simple act let them see meaning for their stress. Since that first study, dozens of similar experiments have followed. It turns out that writing about your values is one of the most effective psychological interventions ever studied. In the short term, writing about personal values makes people feel more powerful, in control, proud, and strong. It also makes them feel more loving, connected, and empathetic toward others. It increases pain tolerance, enhances self-control, and reduces unhelpful rumination after a stressful experience. In the long term, writing about values has been shown to boost GPAs, reduce doctor visits, improve mental health, and help with everything from weight loss to quitting smoking and reducing problem drinking. It helps people persevere in the face of discrimination and reduces self-handicapping. In many cases, these benefits are a result of a onetime mindset intervention. People who write about their values once, for ten minutes, show benefits months or even years later. Everyone has an Everest. Whether it’s a climb you chose, or a circumstance you find yourself in, you’re in the middle of an important journey. Can you imagine a climber scaling the wall of ice at Everest’s Lhotse Face and saying, “This is such a hassle”? Or spending the first night in the mountain’s “death zone” and thinking, “I don’t need this stress”? The climber knows the context of his stress. It has personal meaning to him; he has chosen it. You are most liable to feel like a victim of the stress in your life when you forget the context the stress is unfolding in. “Just another cold, dark night on the side of Everest” is a way to remember the paradox of stress. The most meaningful challenges in your life will come with a few dark nights. Of course this was good to hear while I’m in the middle of my year of reading as many books as I possibly can for the Newbery committee. So worth it! And just remembering that is sometimes all it takes to feel more able to deal with it. Embracing stress is an act of bravery, one that requires choosing meaning over avoiding discomfort. This is what it means to be good at stress. It’s not about being untouched by adversity or unruffled by difficulties. It’s about allowing stress to awaken in you these core human strengths of courage, connection, and growth. Whether you are looking at resilience in overworked executives or war-torn communities, the same themes emerge. People who are good at stress allow themselves to be changed by the experience of stress. They maintain a basic sense of trust in themselves and a connection to something bigger than themselves. They also find ways to make meaning out of suffering. To be good at stress is not to avoid stress, but to play an active role in how stress transforms you. She focuses on learning to use stress to help you engage, connect and grow. As a matter of fact, the first time I did not shake when getting up in front of a big group was when I gave a Chalk Talk as part of a math competition in high school. Yes, my senses were heightened and my heart rate was up. But in this case, since I was absolutely sure I knew what I was doing, it only made me more alert and able to do a good job. Even knowing nothing about mindset at the time – that shows that how I thought about it made a huge difference. You can think of it as nervousness and as proof that you’re inadequate, or you can think about it as excitement and an extra performance boost. Viewing your stress response as a resource works because it helps you believe “I can do this.” This belief is important for ordinary stress, but it may be even more important during extraordinary stress. Knowing that you are adequate to the challenges in your life can mean the difference between hope or despair, persistence or defeat. Research shows that how you interpret your body’s stress response plays a role in this belief, whether you are worried about an exam, getting over a divorce, or facing your next round of chemo. Embracing stress is a radical act of self-trust: View yourself as capable and your body as a resource. You don’t have to wait until you no longer have fear, stress, or anxiety to do what matters most. Stress doesn’t have to be a sign to stop and give up on yourself. This kind of mindset shift is a catalyst, not a cure. It doesn’t erase your suffering or make your problems disappear. But if you are willing to rethink your stress response, it may help you recognize your strength and access your courage. The social nature of stress is not something to fear. When you take a tend-and-befriend approach, even contagious stress can be strengthening. As we’ve seen, caring creates resilience, whether the altruism is a response to rescue us from our own suffering or simply a natural reaction to the pain of others. A sympathetic stress response to another person’s suffering can spark empathy and motivate helping, which in turn enhance our own well-being. Furthermore, we shouldn’t be afraid to let others see the truth of our own struggles – especially when we need their support. In many ways, our transparency is a gift, allowing others to feel less alone and offering them the opportunity to experience the benefits of tending and befriending. The final chapter was about using stress to increase personal growth. Yes! That chapter got me excited. I’ve come out of the worst time of my life – my divorce – and I feel like on the other side I’m much stronger and more resilient. I’ve grown. So this chapter resonated with me. This wasn’t saying that terrible events aren’t terrible. Just that good can actually come out of them. Here I turn to the belief that God has promised to work all things together for good. The author takes a secular approach, but she’s also saying that bad experiences can be redeemed by how you react to them. This is a critical distinction, and one of the most important things to understand about how adversity can make you stronger. The science of post-traumatic growth doesn’t say that there is anything inherently good about suffering. Nor does it say that every traumatic event leads to growth. When any good comes from suffering, the source of that growth resides in you — your strengths, your values, and how you choose to respond to adversity. It does not belong to the trauma. But the interesting thing about the science of stress is that despite the overwhelmingly accepted idea that stress is harmful, the research tells a slightly different story: Stress is harmful, except when it’s not. Consider the examples we’ve seen in this book: Stress increases the risk of health problems, except when people regularly give back to their communities. Stress increases the risk of dying, except when people have a sense of purpose. Stress increases the risk of depression, except when people see a benefit in their struggles. Stress is paralyzing, except when people perceive themselves as capable. Stress makes people selfish, except when it makes them altruistic. For every harmful outcome you can think of, there’s an exception that erases the expected association between stress and something bad – and often replaces it with an unexpected benefit. When I committed myself to the process of embracing stress, I didn’t anticipate the biggest way it would affect my everyday experience of life. To my surprise, I started to feel a flood of gratitude in situations I would also describe as highly stressful. It wasn’t an intentional mindset shift; the gratitude just showed up. I still haven’t fully figured out why this was the biggest change for me, but it probably has something to do with what was most toxic about my experience of stress before I embraced it – a habit of resenting the things in my life that caused stress because I found the experience of stress so distressing. For me, I’m reading this book at a good time – when my main stress is obviously from a good reason, and is very meaningful – being on the Newbery committee and trying to spend every spare moment reading. But I hope when tougher things come along, I’ll remember to look for the upside – and then the upside will actually become greater. Got any stress in your life? I highly recommend this book. I believe that there is only one kind of love — real love — trying to come alive in us despite our limiting assumptions, the distortions of our culture, and the habits of fear, self-condemnation, and isolation that we tend to acquire just by living a life. All of us have the capacity to experience real love. When we see love from this expanded perspective, we can find it in the smallest moments of connection: with a clerk in the grocery store, a child, a pet, a walk in the woods. We can find it within ourselves. The Teaching Company, 2013. 24 lectures on 12 CDs. This is another one a friend recommended to me, but I didn’t actually put on hold until I heard him recommend it to someone else. I’d long thought I’d like to listen to one of the Library’s “Great Courses,” but wasn’t sure where to start. So when I heard this one highly recommended, I decided to start there. One of the best things about listening to these lectures was that I began noticing, more than ever, how many stories fill my days. Shortly after I began listening to the course, a friend told me and a few other people the story of her daughter’s difficult pregnancy. She had us on the edge of our seats and rejoicing with her in the outcome – and I realized she’d done everything right in connecting with her audience and making us feel the emotions along with her. 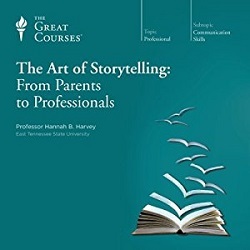 But I wouldn’t have even noticed it was storytelling if I hadn’t been listening to this course. Now, this material is pretty obviously applicable to my job. After all, I conduct storytimes regularly! Though I do feel strongly about reading books in those storytimes, so I’m not going to switch over to the same form of storytelling she’s talking about – but so many of the ideas and techniques are applicable. And it’s also applicable to something I’m doing lately – going to classrooms and talking about the Newbery Medal and what it’s like to be on the committee. Listening to that is helping me to focus on connecting with the audience and telling it as a story – not just as a list of facts about the medal. I was even on a county podcast, and the interviewer asked me *why* I would want to do this, and I floundered for a bit – and then thought of a story to tell that explains it – about that moment of thinking a book is so good, I wish I could tell the whole world about it. Being on the Newbery committee, I really get to do that! But back to this lecture series, the subtitle says “From Parents to Professionals” – the lecturer very much believes this is applicable in board rooms and living rooms both – and I have to agree with her. What’s more, the more I think about it, now that I’m aware of storytelling principles, the more opportunities I am going to find to use storytelling to communicate more effectively. You are currently browsing the archives for the Personal Growth category.